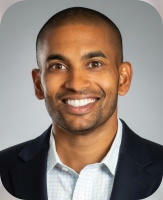 Dr. Dax Varkey is an orthopedic surgeon at Murphy Wainer Orthopedic Specialists in Greensboro, NC. He is fellowship-trained in sports medicine, shoulder, elbow and knee surgery, and hip arthroscopy. His specialties include shoulder replacement, rotator cuff repair, Tommy John surgery, patellar instability surgery, meniscus repairs, ACL and other ligament reconstructions, and complex revision procedures for shoulder, elbow, and knee. Expert in surgical repair of knee injuries to restore stability and function. Treating sports injuries and conditions affecting the bones, muscles & tendons. 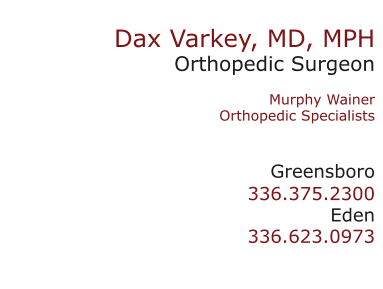 Dr. Dax Varkey is an orthopedic surgeon at Murphy Wainer Orthopedic Specialists in Greensboro, NC. He is fellowship- trained in sports medicine, shoulder, elbow and knee surgery, and hip arthroscopy. His specialties include shoulder replacement, rotator cuff repair, Tommy John surgery, patellar instability surgery, meniscus repairs, ACL and other ligament reconstructions, and complex revision procedures for shoulder, elbow, and knee.